Maori guides lead us into the forest and out on the water. “Step into our World” And we did, indeed – six of us, one evening in February 2007, on a journey called Footprints, Waipoua. Our Ngapuhi guides, Gray and Bim, opened the way with a karakia (prayer), and as we took our first steps into the Waipoua Kauri Forest at dusk, a handsome pupurangi (giant kauri snail) emerged from the foliage beside the track to greet us. We wandered through the forest, at a leisurely pace, listening to stories and songs – myth and history, spirituality and ecology, botany and survival sustenance – of this ancient environment and its earliest inhabitants. We looked in awe at the old, old kauri trees: my favourite ‘’the four sisters’’, a close cluster of four tall trees, branches entwined, and also Te Ngahere Matua – 4000 years old. 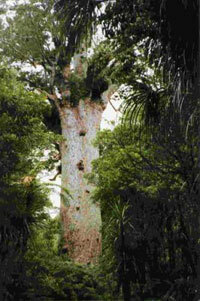 And finally, after bowing our heads in the darkness, with the song of a koauau (flute) filtering through the foliage, we looked up to the forest giant, Tane Mahuta, 51 metres tall – and beyond to the heavens where the clouds had parted to revealing the sparkling stars of the Milky Way – a magical moment. On our way out of the forest we glimpsed a giant weta in a hole at the base of a tree, heard the haunting call of the ruru (morepork), tasted the flesh of a fallen taraire berry, and were warmed by a mug of hot chocolate. 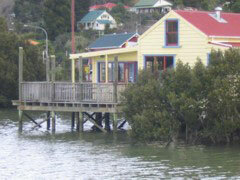 After a final karakia and a feedback session we were delivered back to Omapere Copthorne on the shores of the Hokianga. we recommend that you do too. Crossings, Hokianga took us next day on a second tour run by the same Maori company: a boat trip exploring the Hokianga Harbour. Out to the mouth of the harbour, first entered by Kupe more than a thousand years ago, and a climb up one of the golden sand dunes on the north head. Across the harbour to the ancient pa Whiria, home of Rahiri, ancestor of Ngapuhi, and past an old pakeha mission station, before crossing to Kohukohu and docking beside the café for a drink. Our final stop Mangungu, where the Treaty of Waitangi was signed by a large group of chiefs on 12 February 1840, and where we were welcomed by a kuia, the kaitiaki of the historic Methodist Church and Mission House there. Another informative and entertaining journey, with our guides telling stories of both Maori and Pakeha history around this beautiful harbour as well as pointing out interesting geological and botanic features. As well as the two exciting new Maori tours, Footprints and Crossings, there’s much to explore in the area. Rawene and Kohukohu, the two characterful villages on opposite sides of the harbour, are joined by a regular ferry service (which takes cars as well as people) and both have excellent cafes and art galleries. There’s a mangrove board walk near Rawene, a clifftop walk on the south head of the harbour, and, for the fit and adventurous, a stunning three-day coastal walk from Omapere south to the Kai Iwi Lakes. 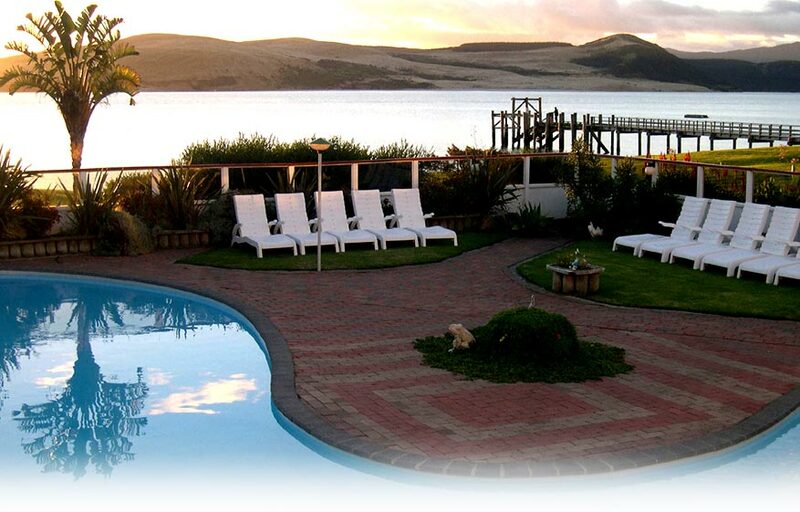 So next time you’re looking for a destination warm with people, rich in Maori and Pakeha history, and blessed with diverse stunning bush, land and seascapes, head to the Hokianga… ‘’the spring in the land of light”.